A Brief History of Telluride concisely chronicles the boom and bust cycles of Telluride and its surrounding communities from the 1860s to the present. Every page brings to life those fascinating former days: the arrival of the first prospectors, the forced departure of the Ute Indians, the booming and bustling mining era, Butch Cassidy’s bank robbery, avalanches, miners strikes (including shootings and bombings), the rise and fall of the Rio Grande Southern Railroad, and the beginnings of the modern skiing industry. In this little book you will meet fascinating residents like Lucien Nunn, who almost single handedly saved Telluride’s mining industry with the introduction of the first commercial use of alternating-current electricity in the world. Or learn about dashing (and conceited) Bulkeley Wells who managed the Smuggler-Union Mine and also led the Colorado militia against his striking workers. Or discover more about Charles Waggoner, who was reported to play Robin Hood during the Depression, stealing from rich eastern banks to protect his local depositors. 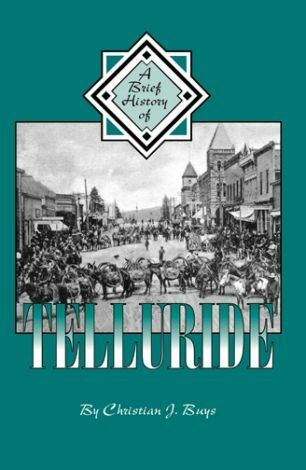 A Brief History of Telluride also contains several maps of the Telluride region, eighty-four photographs of the town and surrounding areas, and a complete index. Author Christian J. Buys has been interested in Telluride’s unique history since he first visited the picturesque mountain town in 1966, while pursuing a doctorate in psychology at the University of Colorado. Awarded Fulbright Scholarships to Egypt and Malaysia, Buys and his family have traveled extensively. Currently Dr. Buys is a professor of psychology at Mesa State College in Grand Junction, Colorado. This is his sixth book, three of which have won publishing awards.